About once a month I cook my version of a healthier full English breakfast. This includes bacon, sausage, egg, tomato, mushrooms, baked beans (low salt and sugar of course) and sometimes a piece of toast. Out of these ingredients, it's the sausages that have the biggest effect on the overall meal success. 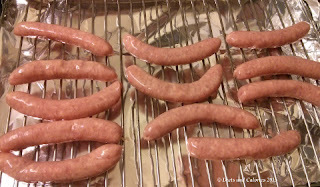 There are so many types and flavours of sausages with different spices added and varying percentages of pork or beef filling. Then there are the vegetarian alternatives, of which I've tried quite a few. 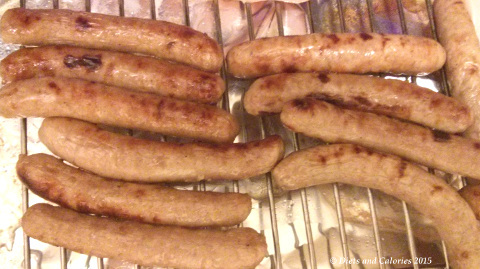 Anyway, while searching for healthier sausages recently, these pork sausages by The Good Little Company appeared in the results. There are two types: Good Little Sausages and Great Big Sausages. 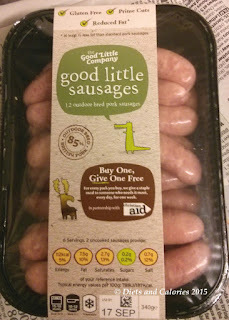 Ever conscious of the calories, I purchased the Good Little Sausages which have 56 calories each. The full English breakfast is one of my family's favourite meals, however I never cook it for breakfast – far too stressful and who has the time? Instead we enjoy this as our main evening meal where we have time to sit down and enjoy it. What a lovely message! Looking through the ingredients, they have a pork content of 85% which is quite high, with not too much in the way of fillers (rice flour and chick pea flour). Looking at them sitting in their packet, I thought there were too many for four of us. However, after taking them out ready for grilling, I could see I’'d have to use them all as they are quite small. I popped them under the grill for about 15 minutes, turning frequently because they did burn quickly. There was a bit of shrinkage, but not much. No fat dripped down during grilling but there was a small amount on the skins which I just dried off with kitchen paper. I didn't tell anyone anything about the sausages and just waited to see what they thought. Although my youngest drowned hers in ketchup, she gave them a thumbs up. My husband said they were really good, though he wasn’t sure if they were one of the vegetarian options I sometimes do (which was why he didn’t give any to the cat sitting expectantly at his feet)! My other daughter was equally happy with them and thought they were cute! I found them quite tasty, very mildly spiced, nothing too overpowering. A couple was plenty for me but I pile my plate with grilled tomatoes and mushrooms. I’ll certainly buy these again. 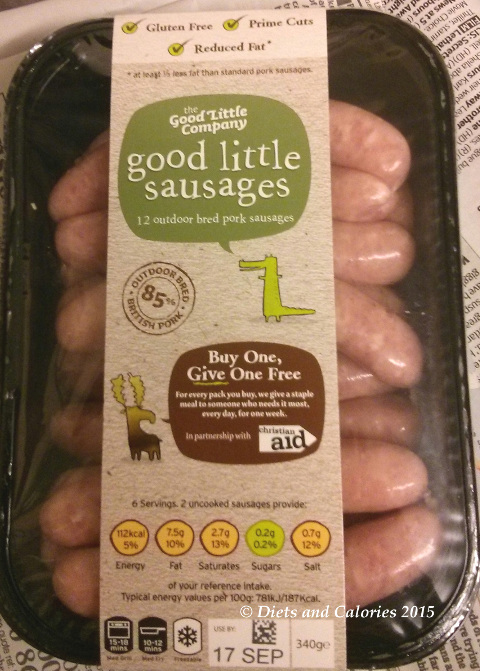 The Great Big sausages have identical ingredients. They're just about twice the size. Nutrition information per 100g: 187 calories, 12.5g fat, 4.5g saturates, 2.8g carbohydrates, 0.4g sugars, 16.9g protein, 1.5g fibre, 1.2g salt. Ingredients: Outdoor Bred British Pork (85%), Water, Pasteurised Free Range Egg White, Rice Flour, Chickpea Flour, Sea Salt, Preservative (E223) (Sulphites), Cornflour, Salt, Black Pepper, Ground Ginger, Ground Mace, Ground Nutmeg, Ground Pimento, Antioxidant: E300, Dextrose. Sausages filled into Natural Lamb Casings.